Keep all cosmetic necessities close at hand. 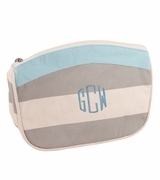 Ladies monogrammed cosmetic bag is a warm pale gray and natural striped canvas fabric with zipper closure. 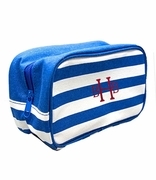 The neat compact shape makes it perfect for storing cosmetics and it will fit easily into a bigger suitcase or handbag. 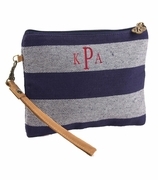 Use it when you travel or to take cosmetics to the office. 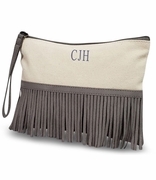 Name, initial or three letter monogram included with purchase. Ladies cosmetic tote has an orange printed interior with mini anchors and measures 11"W x 6"H with envelope bottom.